An Almond Pear Wedding Cake. 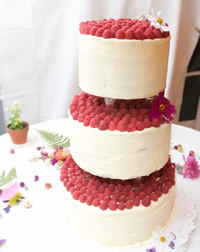 An Almond Raspberry Wedding Cake. A Swiss Dot Wedding Cake. 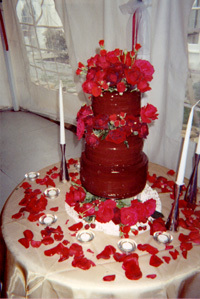 A Chocolate Ganache Wedding Cake. A Chocolate Raspberry Wedding Cake. At The Alternative Baker, when we are commissioned to present a wedding cake for a couple, we come up with a cake, or cakes, that represent the individuality and personality of our clients. For previous clients, these cakes have been designed to reflect the tastes and flavors which are important to the happy couple: sometimes favorite foods (often chocolate), childhood memories, family recipes, homegrown fruits, special dietary needs--all of these have come into play. 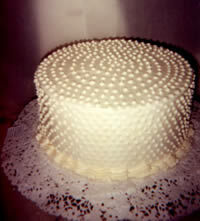 Celebration cakes have had elements such as chocolate devil's food layers, fine Belgian chocolate ganache, crunchy hazelnut and almond meringues, candied tangerine peel, pastry cream, fresh ripe seasonal fruit, whipped cream, hazelnut buttercream, fine vanilla buttercream, ripe raspberries, almond buttercake, vanilla pound cake, various summer fruit mousses and more. Each of these superb fillings and cakes, just to select a few choices, are made from scratch right here in our storefront retail bakery in the heart of the Rondout. In Kingston's downtown waterfront, we have built our reputation on the excellence of our products and the integrity of the ingredients used---as we say, " you can't get out of a cake what you don't bake into it!" Everyone has been to weddings where the cake slices sit on their plates, untouched, overlooked and forgotten once the wedding is past. When designing a wedding cake, an important consideration is how the cake will appear on the plate--will there be surprises to discover, secrets to be revealed, are there contrasting layers and fillings. Even just a, "What is that? ", is better than the standard reaction to a ho-hum wedding cake: ho-hum. The cake is a dessert at feast's end to be savoured to the last crumb! We pride ourselves on the calls we have received from wedding guests who have exclaimed, "That was the best wedding cake I've ever tasted!" Our philosophy is this: as much as the gown, the flowers and the food, the wedding cake is an important part of the wedding celebration, and not just an afterthought, an amenity thrown in as part of the wedding package. We feel it is a beautiful tradition and a memorable part of the entire wedding experience: a personal expression of the couple's tastes and personalities. Wedding cakes represent for us as well a culmination of the wedding feast. As the final bite, the sweet note, with champagne glasses lifted while the guests watch, the new couple feed one another. For us this simple action with the cake itself is a physical expression of the sweetness of love, and especially, for this joyous couple on their day of days! It is a sacred trust to be the baker for such an occasion. Deriving from the ancient custom of breaking bread and the laying down of weapons, our modern day wedding cake is a breaking of bread. This is done with far-flung family and friends, business associates and others, now brought together to be witness to and take part in the celebration of the union of these two lives. 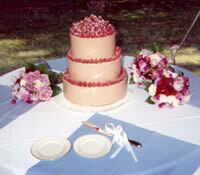 In our view, the wedding cake is a further example of this breaking of bread and symbolizes, as the last food of the wedding night, a mystical and magical union of earth (flours made from grains grown in soil and fruits which sweeten the cake), fire (baked in an oven), air (leavening or lightness whipped into the cake and frostings) and water (moisture's essence). It is a statement by the couple as well, like the ingredients which were once disparate parts, they too have combined in a new way to make something whole and wonderful. 1. 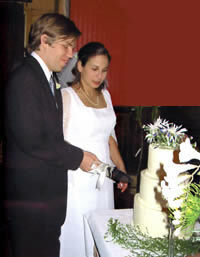 Contact us to see if your date is open on our calendar, as we only bake one wedding cake per weekend. 2. Make an appointment to sit and meet with Essell and be ready to discuss what flavors (orange, chocolate, vanilla, hazelnut, etc. ), which textures (mousse-y, dense and buttery, light and fruity, etc.) you require. Sometimes a couple will want to recreate a cake or dessert from a family recipe or a favorite Grandmother’s cake. Bring this with you and any other ideas important to you as a couple. We prefer to schedule appointments after-hours as this allows no interruption from the telephone and the like. However, if this is not convenient for your schedule, we can make other arrangements. At this time we might schedule a trial wedding cake. 3. If you decide we are to be your bakers, we require a non-refundable $50.00 deposit to hold your day for you. If for some reason the day needs to change and we are still available, then the deposit would go towards the alternate date. If this new date is not available, the deposit is forfeited. Any deposits made will go toward the overall purchase price of the cake. 4. If we are to make a trial wedding cake for you, we require at least a week’s advance notice in order to create all the elements necessary to build a four-inch cake for you. There is a flat $20.00 fee for this cake, payable upon pick-up. In the trial cake, we focus upon the flavors and textures desired by the couple—virtually no decoration is implied. 5. If the cake is to your wishes, then be prepared to have a wedding cake delivered that will best represent your tastes and wishes as a couple. But if you feel as though the cake needs refining or changing in any way, then we will make and bake another one for you, as you desire until we get it just right. Each cake is still just $20.00. 6. After all is arranged and agreed upon, (price, delivery time and place, style of tiers, type(s) of cake(s), decoration, etc.) we will either give you on the spot or mail a copy of the contract to you. If at any time along the way, please do not hesitate to contact us for any reason whatsoever—your pleasure and joy is our work!